These brand new baseball rockers are meticulously handcrafted for the baseball purist using genuine Marucci baseball bats and only the finest baseball materials. 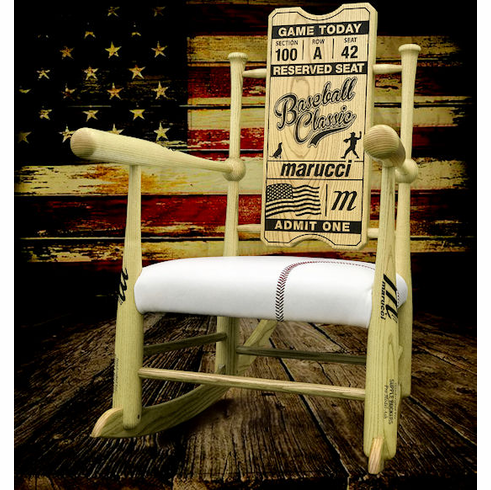 The six baseball bats, which are factory turned, along with the �ticket stub� backrest, rockers, and support members are all crafted from Northern white ash lumber. The "ticket stub" comes with the Baseball Classic logo laser engraved in the center. This brand new Marucci design usually ships within 2-3 weeks. For an additional $100, we can have the �ticket stub� personalized with your logo or text laser engraved. These graphics can be customized for a birthday, graduation, wedding, retirement, gift for coach, gift for player, man-cave, VIP Club Suite, etc. The custom rocker usually ships within 3-4 weeks...once artwork/text is submitted...call for details. The premium oil-based stain and finish provides outstanding scratch and stain resistance to help the rocker age gracefully. We offer one size rocker, specifically engineered to conform to the smaller lead-off hitters and large enough to rock the burly clean-up players. The arms of the rocker are designed at a comfortable height to support rocking and bonding with your future superstar baby. If baseball is your passion, as it is for us, this chair will provide a retreat from life�s busy schedule and allow the mind to remember how a ball game can make you forever young...the thick as perfume smells of freshly cut outfield grass, suntan lotion, hot dogs and roasted peanuts; the electricity of the crowd and how much bluer the sky is when you are lucky enough to watch a game from a front row box seat; the first big league park you ever visited and that unforgettable moment you snagged a foul ball amongst all the other fans. Silently rocking while your mind explores these sights, smells and sounds only a baseball game can produce, the experience will last well past the ninth inning. These handcrafted rockers are made by a family owned, old-school business that believes these chairs can inspire, encourage and motivate. They provide the baseball purist customer a unique work of art that can be handed down through many generations. Baseball is timeless, precious, and forever. So is your family. So are these rockers. Appx. dimensions and weight: 42" Tall x 40" Long x 27" Wide x 40lbs. Shipping crate including rocker: 46" Tall x 42" Long x 30" Wide x 100 lbs. (Must ship to a commercial address in the contiguous 48 states!) $275 extra shipping charge per rocker to cover actual costs for insured freight. Email or call us with any questions you may have.